Building workshop TOMA! have designed a shape-shifting wooden sculpture for this year's Lively Architecture Festival in La Grande Motte, France. The PrortHotel utilizes the parallax effect to change its form depending on the desired point of view. 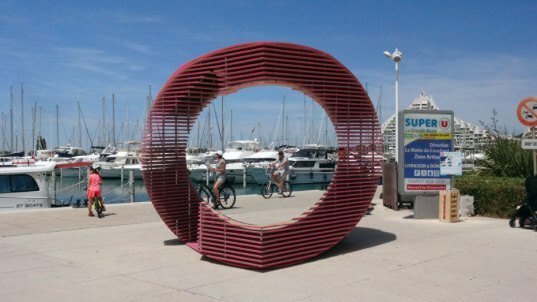 The sea-side structure can be turned to frame the city panorama or the boats surrounding the quay, and can be used as a seating structure and shelter. Antonio Nardozzi & María Dolores del Sol Ontalba [TOMA!] designed the installation as an experimental piece of architecture that can appear two-dimensional when viewed from a certain angle. 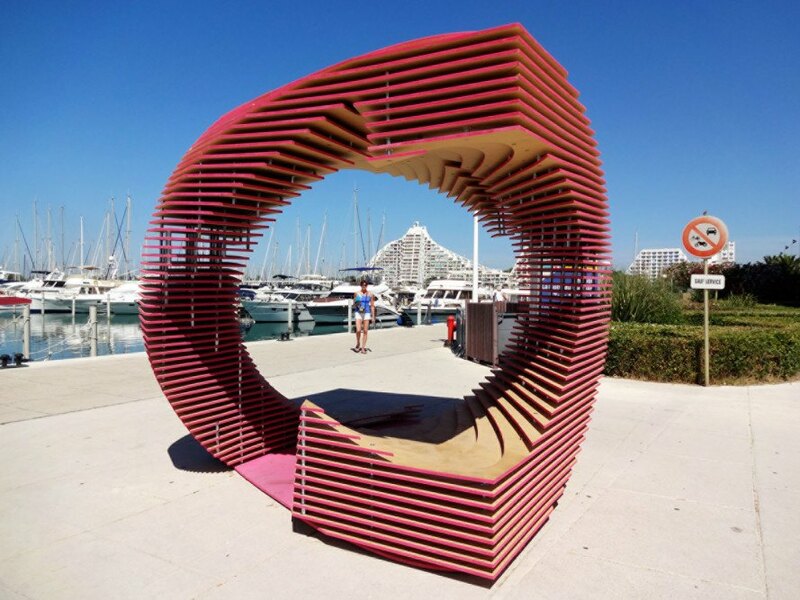 The structure, shaped out of a 3×3 meter cube, is made from 120 MDF (medium-density fibreboard) boards painted in pink. Layers of wood were mounted on top of each other using 1500 metallic screws which join and separate the wooden panels. The inner part of the volume was carved out in flowing shapes as if they were made by wind erosion. Visitors of the festival can walk through the structure and use its parts as benches, sheltered by the overhangs. Antonio Nardozzi & María Dolores del Sol Ontalba [TOMA!] designed the installation as an experimental piece of architecture that can appear two-dimensional when viewed from a certain angle. The structure, which forms a 3x3 meter cube, is made from 120 MDF (medium-density fibreboard) boards painted in pink. Layers of wood were mounted on top of each other using 1500 metallic screws which join and separate the wooden panels. The inner part of the volume was carved out in flowing shapes as if they were made by wind erosion. Visitors of the festival can walk through the structure and use its parts as benches, sheltered by the overhanging pieces.